A blend of gluten free rolled oats with dried apple, raisins, sunflower seeds, chia seeds and freeze dried raspberries. Made in small batches. High in fibre. Source of protein. Gluten free. Vegan friendly. 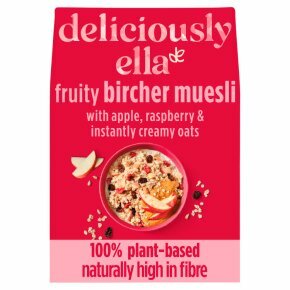 Our Bicher Muesli is a family favourite. We finely mill the gluten free oats, before stirring in chopped red apple, raisins and raspberry pieces for a little sweetness. We finish with sunflower seeds and chia seeds for texture. Simply add milk or juice, and it will go soft and creamy in seconds. It takes time to create the perfect muesli, so we make each bag in small batches. How We Like It: Banana Bircher Soaked in coconut milk and then topped with sliced bananas and almond butter. Simple Pancakes Mixed with almond milk, chia seeds and gluten free flour to make a simple pancake butter.